Give it a try on some of our casinos, and make sure you have taken their welcome bonus before hitting the spin button. Best of luck on the stage of X Factor Slot! Welcome to X Factor Slot, the online slot game which prizes the show that firstly premiere in the UK and because it was so popular and interesting, it spread all around the world. It’s Ash Gaming that created much sci-fi and TV show themed online slots, and they are also responsible for X Factor slot. The online slot game offers a realistic view of the show, and if you’ve seen it, you will definitely recognize the screen and what it offers. You can start playing this five-reeled and 20 paylines online slot game as soon as you find a casino on the side of the article. The game can be played with a denomination range from £0.02 all the way up to £400.00 where the jackpot of the game can go as high as x5,000 for the right combination on the screen. There are two bonus features and 95.00% RTP making it an acceptable slot worth finding its name on your to-play list. Try the game now on some of our casinos or read more about the slot game by scrolling below. 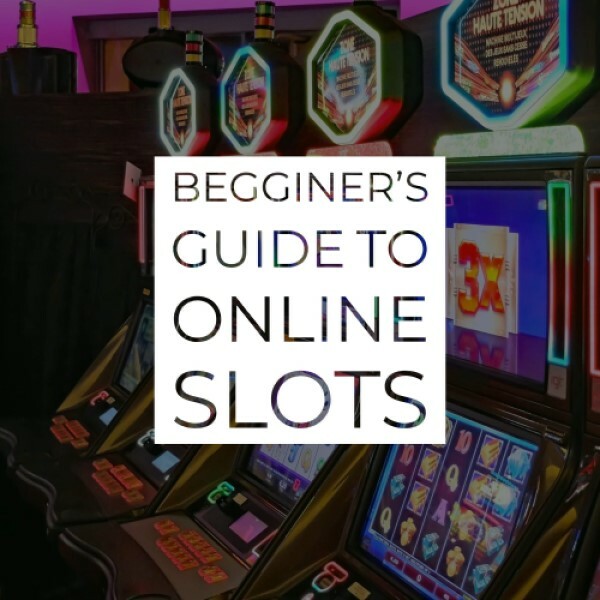 The first question that any online slot player asks is where to play the slot and which casino has it. We are all aware that not all the casinos have all the slots in the world – that would be nearly impossible, knowing that there are more than 10,000 online slots. That means, we have to make things easier for you. The best place to play X Factor slot and to get the best welcome bonus for the same is BGO casino. BGO is found in 2012 and quickly joined to leading casinos in the world with its game range, awesome conditions and welcome bonuses and the customer support that they are offering. The casino plays an important role in your gameplay as you will spend most of your time there, and BGO is the right place to do that! The online slot game will definitely remind you of the biggest singing competition in the world and it has some fantastic music in it, so make sure you turn the speakers up before spinning the reels. The design is quite fantastic and offers top-notch graphics that will follow you everywhere on the screen. You will see the same background as the one on the stage of X Factor, and that will give you the Rockstar feeling. We can see neon lights shaped in a big X as well as black and red colours on top of the cheering crowd silhouettes. We can see the logo of the game at the top of the slot where you can also find your balance, stake, and options of the slot. On the sides of the reels, you will notice the transparent paylines, and if you mouse over them, they will appear on the screen so that you know what to expect. You can also choose the number of paylines by clicking on the desired number as well. At the bottom, you will find all the adjustable options and features of X Factor Slot, like the stake per line, the number of paylines, the total stake and you can also find the Auto Play and Bet Max features which are right next to the magical spin button. All of the symbols in the game are related to the theme and they will give you the impression that you are on the show itself while playing. The best thing is that unlike most of the online slot games, X Factor slot doesn’t have lower or higher valued symbols, but they are all treated as higher valued ones. When it comes to the normal symbols, they are represented by an X Factor logo, a Microphone, a Speaker, A male and a female singer as well as a silhouette of a singer. You can also find a CD as well as an X Factor strap. There are few extra symbols that Ash Gaming decided to add in this slot, and they are represented by the two scatter symbols which are responsible for the bonus features of the slot. We can see a giant X symbol which is here to trigger the Booty Camp feature while the other scatter is the Judges Bonus symbol and it’s here to trigger the same named bonus feature. There is no wild in the slot, and when you start playing you will realize there is no need for one as well. Scroll down below to read more about the bonus features. If you fancy the most famous singing competition in the world, X Factor, you will definitely fancy this slot. The very first thing to do if you want to start playing this five-reeled 20 paylines online slot game is to select the casino where the magic will happen. The casino is a really important factor in your online slots spinning, as that’s where all the action will happen. Each casino has unique games in its arsenal of slots, unique welcome bonus as week as customer support, so you want to find the best one for the game. The casinos are also responsible for what you deposit and win, and they will also hold your personal and banking information in their systems, hoping to encrypt them and save them from outside attacks. That’s why you need to find a solid casino to play the game at. As we already mentioned above, the best place to play X Factor slot is BGO casino, and it’s one of the safest casinos to play a slot game at. Find it on the side of the article. Once you’ve found a casino and you have claimed the welcome bonus that it offers, it’s time to set the denomination of the slot. This is adjusted by setting the coin size at the bottom of the screen, and the range that you can play with starts from £0.02 and it goes all the way up to £400.00. The number of paylines is not fixed, meaning you can adjust them to any number that you want, from 1 to 20, so depending on your budget for the game and for this session, make sure you make the right choice. We would suggest you play with all the paylines activated and lower the coin size if you are low on budget. It’s better to play with a smaller hook than not to get paid for a winning combination just because the payline wasn’t active. All of the modern slot games have the Bet Max feature in the arsenal of features of the slot, and so does X Factor Slot. The Bet Max sets all the parameters of the slot all the way to the maximum like the denomination, coin value and level of the game. The Bet Max also activates all of the paylines, meaning your spin will cost as much as it can, or in this case, £400.00 for one spin. If you fancy this feature, you can find it at the bottom of the screen, just below the reels next to the spin button. Another interesting feature that X Factor Slot has is the Auto Play feature, and it’s also at the bottom of the screen next to all the other features. This one sets the reels of the slot spinning automatically, with you only having to set the denomination and the number of auto spins. The number of auto spins is given as an option on the drop-down menu and you can set from 1 up to 500 auto spins. 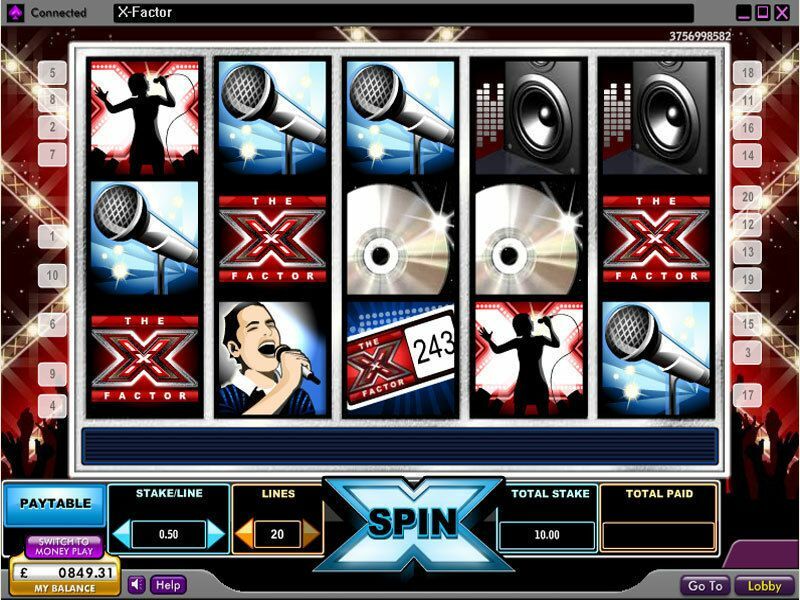 The maximum jackpot of X Factor slot is 5,000 credits while the second highest is 2,500 credits. You can see the right combinations on the “help” or “paylines” to see which symbols pay out the most and where you need to land them. Let’s see the bonus feature of X Factor slot. 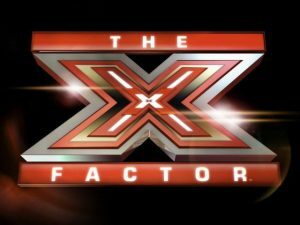 As we already mentioned above, there are two Bonus features in the slot, and they are making the whole X Factor slot look more and more like the show itself. The best thing is that you can re-trigger the feature by landing three or more of the Giant White X Symbol. Everything in this game is worth more, and there are special stars during this feature which you need to collect and if you manage to collect 10 of them you will be taken to a new screen which is the stage of X Factor show. They will come to you one by one, and you need to choose whether the one on the screen stays and you open it, or you want to skip it and open the next option. The second feature of the slot is called the Judges Bonus and it gets triggered by the scatter symbol which has “Judges Bonus” on it and a shadow of four judges. You need to land three or more of the scattered symbols to trigger this mini-game. You will be hosted by four judges and you need to press Reveal Verdict to see what the judges think. They will answer 1 by 1 and you will have a cash prize each time there is a positive answer. If you get one negative answer, you will be returned to the base game. We know a bit more about the slots as we play each of them while reviewing. There are some things which are the same for every slot, and some which we would like to share that are strictly for this game, so here are our X Factor Slot tips for you. You can also see our Do’s and Dont’s article for more tips! Always set the denomination according to your budget. Since the paylines are specific in X factor Slot, we suggest you activate them all and play with the coin value and the denomination with what you can afford. We already mentioned what the Bet Max does, and our tip for this feature is to completely neglect it if you are playing without a plan or a limit to your money. The Bet Max feature is the reason many people lose all of their wagered money, as your spin will cost £400.00 at X Factor Slot. The Auto Play feature spins the reels automatically, and people tend to click this feature and run off the computer or leave their mobile on the table spinning. You can be doing all sorts of things while this feature lasts, like watch the Premier League game, make your fav cup of tea or do whatever you want, but the truth is, you always have to have your eye on the game. You can always cancel the feature at any given time, and if things start to go wrong, that’s exactly what you need to do. If things start to go downhill and you see you didn’t win for a brief period of time, give the feature or the whole slot playing a rest and try your luck some other time. It’s not a secret anymore – more than 50% of all the internet users are coming from mobile devices and playing slot games is not an exception. That’s why Ash Gaming have made X Factor Slot responsive to and available on the smartphone which is in your pocket right now. 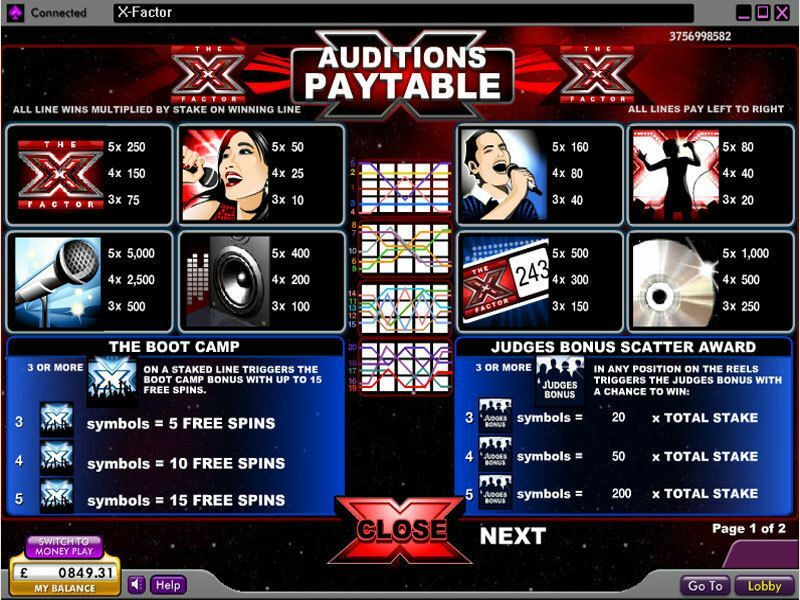 You can enjoy X Factor Slot on your tablet and PC/Lap Top or smartphone regardless if you have Android, iOS or Windows. Another thing worth mentioning is that you can play the game directly from a browser or you can play it from an online application found in the stores. The application is provided by the Casinos that you will be playing at, so you need to be searching for them in the stores. The RTP is the amount the game returns to the players over a long period of time. Every slot machine has to have a stated RTP which is given to the players by the developing company, and that’s a law in almost every country in the world. The RTP is calculated over a longer period of time or over a number of spins. You can read more about the RTP on our Detailed RTP Guide. The X Factor Slot RTP is 95.00% which is exactly as the online slots average, meaning it’s acceptable to be played. This means that, on average, if you deposit £100 the player will get £95 back, but of course, that’s not how the calculations go, fortunately. To round things up, X Factor Slot is a satisfying game which you can find in several casinos online, out of which BGO is the best one for this slot. The game has five reels and 20 paylines and with the maximum bet of £400.00 you can end up with 5,000 coins if you land the perfect combination. The screen is a sharp one and reminds of the X Factor show that’s the most popular singing competition in the world.